For the Sonic Drift 2 level, see Mystic Cave (Sonic Drift 2). Mystic Cave Zone is the sixth zone in Sonic the Hedgehog 2. This zone was referred to as Dust Hill Zone in the Simon Wai prototype and several gaming magazines. The reason gaming magazines referred to the level as Dust Hill was probably due to the level select labeling the level as such. 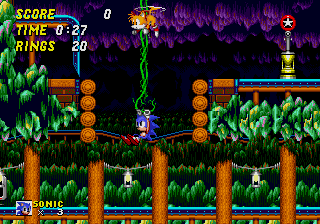 It is also one of the first levels in a Sonic game to fall under the Underground Cavern theme. This zone is infamous for having an inescapable pit of spikes in Act 2 that is very easy for players to fall into. Should a player fall in there as Super Sonic, they will be waiting down there for a potentially long time. In the 2013 version, the spikes in the pit have been removed, thus falling down there will lead to a pleasant surprise: the secret entrance to Hidden Palace Zone! Crawlton - Centipede enemy, fixed to the wall and extends to attack Sonic when he approaches. Flasher - Firefly enemy, moves around slowly and is invincible when flashing. Referred to as "Frasher" in Sonic Jam, which is Engrish for "Flasher".